Every educator pours their time, effort, and love into helping students learn. However, for all the effort put into helping students succeed, there is equal disappointment felt when academic dishonesty is recognized on assessments or assignments. As the use of computer-based testing software increases in education, the means in which students cheat have become ever more complicated and creative. When faculty hear about a technology such as lockdown browsers, it seems like a solution to a frustrating problem that has been nagging at them for years. You can take advantage of the convenience of computer-based testing while employing a technology that promises secure exams. It’s exactly what you needed! Right? While the idea may seem perfect, the execution often isn’t. Lockdown browser software introduces many new problems for students. Worse, on top of all those new problems, it doesn’t even fix the original problem you brought it in to solve. The supposedly secure exam software used by lockdown browsers can cause computers to crash, keep applications from working even after the testing is complete, and introduce new viruses onto the students’ computers. You can recommend students backup their computers before each test to be safe. You can tell students to install anti-virus software before downloading the lockdown browser software. You can do the research and help talk them through how to fix the things still not working after the test. However, these aren’t completely reasonable solutions to the problems, of which you shouldn’t have to deal with in the first place. Institutions have limited infrastructure to work with, and it’s already being bogged down by the BYOD culture that brings thousands of devices to campuses each day, most of which are connected to their network. 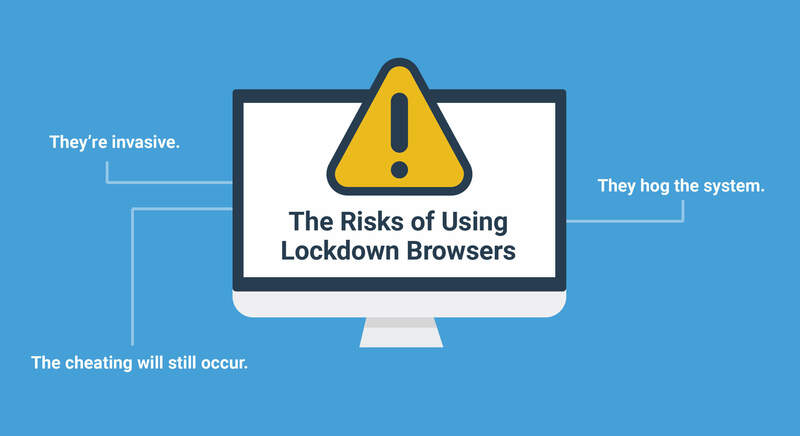 Requiring a number of students to all use lockdown browser software at once just exacerbates the problem further. This now means that if the lockdown browser testing overtaxes the system and students lose internet access, they lose access to the test and their completed work. Having to restart an exam a student was almost done with because of a network problem can cause major problems for both the students themselves, as well as your program or institution. Computer-based testing doesn’t have to come with these issues. Secure, application-based exams can cut out the need for internet and circumvent the problem altogether. Lockdown browsers are easy to hack. Do a quick Google search and you’ll see lots of methods students have found to get around them—and students know it. If the whole point of lockdown browsers is to have more secure exams, you’re probably not getting what you paid for. Testing software shouldn’t get in the way of a student’s grade—and it certainly shouldn’t cause problems with their personally owned computers. Technology can improve education and it can solve problems teachers have been dealing with for years, but it has to be the right tech used correctly. Exam security is a worthwhile goal to reach for, but do the research to find a tool for secure computer-based exams that works for your program.